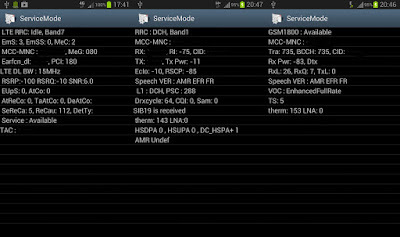 Samsung Service Mode is a tool used to show useful information hidden by Samsung. The information is useful to engineers in mobile network industry. It is also useful for application developer that need cellular information such as network code, cell id, LAC, received signal level etc. Samsung used to allow user enter a specific string of numbers with *# to enter the service mode. However, in recent model like Samsung Galaxy SIII and Note II, the secret code is disabled. Users cannot easily get the hidden service mode. Fortunately, the hidden menu is still available. This application brings back the useful functions to you. 0011 is used to the check RF status. Depends on your network type, it will display GSM, WCDMA or LTE information. In GSM and WCDMA, you can have the cell id (CID) information. In LTE no CID is provided. Only PCI is shown in LTE page. Users can use 4636 to get LTE cell id if needed. Of course, the RRC state, Signal level (Rx Pwr, RSRP, RSCP) are available and very useful. *#2263# is used to set specific band of radio access technology (RAT). Depends on your device, *#2263# will list out the supported RAT and corresponding supported band. 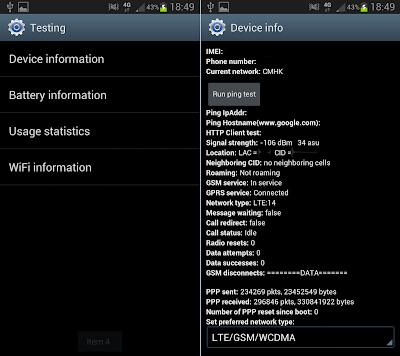 For example, in WCDMA Band Preference, my UE supports 850, 900, 1800, 1900 and IMT20000. 850 is referring 850MHz band. Similar presentation can be found in GSM Band Preference. In LTE Band Preference, it used 3GPP terminology. For example, LTE Band3 is 1800MHz band and LTE Band7 is 2600MHz. If you need detail info, please refer to 3GPP TS 36.101 for the LTE band information. Remember to set the device back to "Automatic" after you finished your tests. Otherwise, the phone may not function properly. This secrete code is not exclusive to Samsung device. It should be available in or Android device. 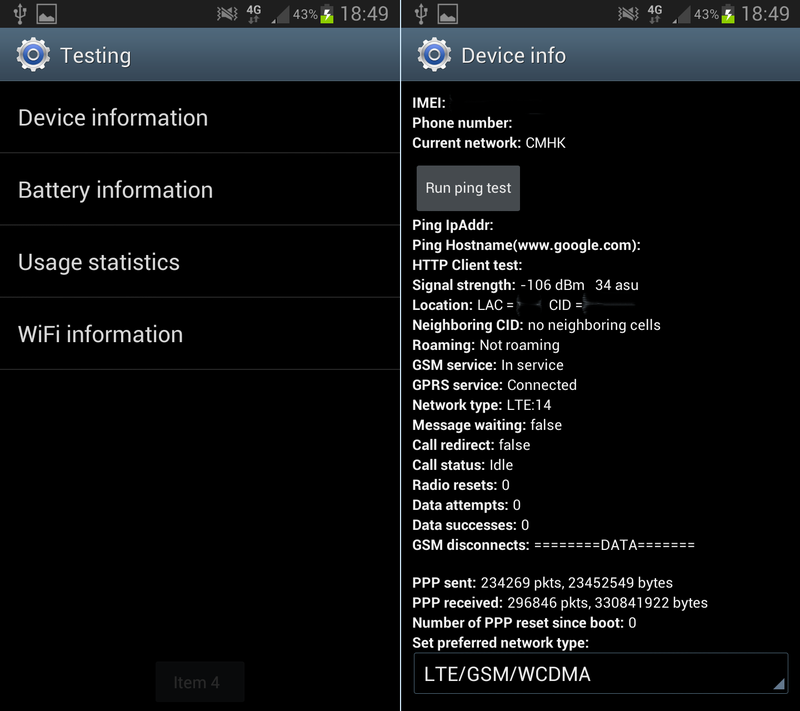 Under Device Info you can find the IMEI, signal strength, LAC and CID information. In Device info page, you can also set preferred network type. However, if you don't know what is your carriers' supported network type, you better not to alter it. The function will be similar to 2263. If you messed up with the network type, you should use *#2263# and set the band to "Automatic". After reboot your device, it should be back to normal. *#7284# -- Phone Utility (USB Settings) // WASNT ABLE TO UNDERSTAND-if u can please advise.